I agree I love the bag. LOVE his bag!!!! this print is very nice!! Amazing. I love his bag and his shoes, not to mention the beard! This bag is slaying me. I want it. While we’re at it I’ll take the coat, the slacks… and whatever shirt that is, the end of his sleeve is happenin! Classic style mixed with bright colours and funny things like his socks. Like it! That is really cool pic. I really like it. Have a nice day. Obsessed with that bag! Love the blue shirt, the glasses, and those shoes! All the little details like the striped socks poking out, and the fur collar make this so special. take a look in” progetto fede” if you like that bag…..
Hehehehe he certainly keeps the eye and brain moving doesn’t he. 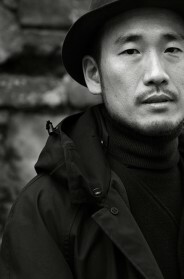 If this were in black and white it’d be channeling August Sander as well. Apart from the [email protected]#[email protected]#$%! trouser length. 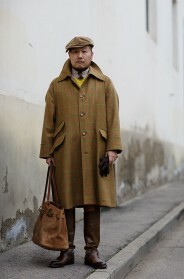 Is that a vintage coat with an astrakhan collar? Can I tell you I am kind of tired of hipsters? “In former times…”, that’s how the story begins. Great look, the bag is so great! I love the entire look, especially the bag. Remind me the guatemalan brand Médium http://medium.tictail.com They got similar bags. Michael has an amazing style!! sooo cool! Ironically throwing together an assortment of visual clichés makes, I think, not a great outfit. The gent clearly has a sense of proportion and color, but his obsession with self-expression and, by extension, complete disregard for the body beneath the drapery is – again, speaking strictly for myself – off-putting. Are high water pants really a good fashion statement? I don’t think they are – until it goes mainstream, they just look like pants that are too short, and that is NOT a good fashion statement! WOW! I am loving the pop of turquoise, and that BAG. WOWZERS! His bag and trousers are to die for! The bag makes the whole outfit come alive. I don’t like those shoes treated so poorly, they give me a sensation of sloppiness. Yet, so much SO WRONG. Great look! Love the street urchin vagrant look! Very coolio! Good googly moogly! My kind of outfit! I am so jealous that he owns that bag and those shoes. I need to up my shoe and bag game. Il a l’air très satisfait de sa tenue et nous aussi ! it’s very comical ! Perfect tilt to his hat! He’s a friend of mine!! So “stiloso”…as we usually say in Italy! I have such an aversion to big beards that it borders on allergy, and I can’t see beyond that to the clothes. I’d love to have a conversation with this guy. He is super cool. Love the look! However, I miss the Sartorial lunch/dinner! Is it not that time of year when it is due? Sorry, just can’t get with the high-water trousers. And with a chesterfield with persian-lamb collars, bizarre! Love it all! Especially that bag! qualcuno sa dove sono vendute borse come quella? The coat collar is Astrakhan ( I think that’s how you spell it!). My wife just inherited an Astrakhan coat of her mum and loved it until she found out what it’s actually made from. Makes ordinary fur seem less grim… Nice hat though. Back to the old country…. Beard plus Carpet Bag is Win. Nice astrakhan, otherwise very lazy. somebody know whose that bags? I truly detest the entire look. 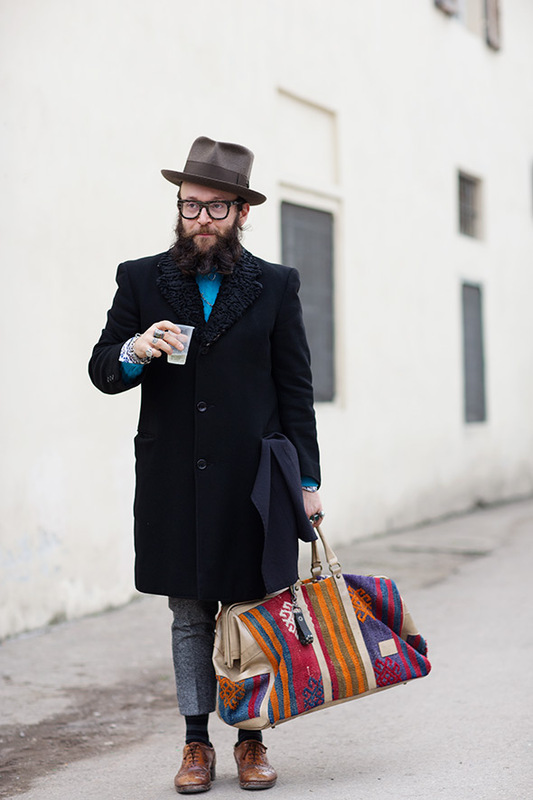 The beard is ridiculously unattractive, the bag silly and the short pants/socks/beat-up-Oxford simply not flattering. 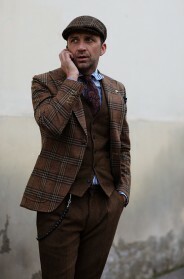 Call me old fashioned, or call me an arbiter of classic style and a defender of traditionally handsome men – I do not approve of this whole “hipsterish, let me try to look as unattractive as possible so I look cool thing trend”. I much prefer a well groomed gentleman with a charming smile, handsome face and impeccable tailoring. Is this the character Eliza Doolittle would have ended up with if she had never met Professor Higgins?